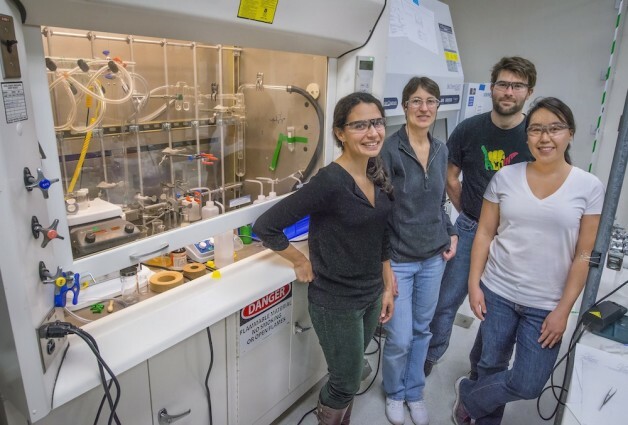 Berkeley Lab scientists find that an iron-binding protein can transport actinides into cells. Scientists at Lawrence Berkeley National Laboratory (Berkeley Lab) have reported a major advance in understanding the biological chemistry of radioactive metals, opening up new avenues of research into strategies for remedial action in the event of possible human exposure to nuclear contaminants. Research led by Berkeley Lab’s Rebecca Abergel, working with the Fred Hutchinson Cancer Research Center in Seattle, has found that plutonium, americium, and other actinides can be transported into cells by an antibacterial protein called siderocalin, which is normally involved in sequestering iron. Their results were published online recently in the journal Proceedings of the National Academy of Sciences in a paper titled, “Siderocalin-mediated recognition, sensitization, and cellular uptake of actinides.” The paper contains several other findings and achievements, including characterization of the first ever protein structures containing transuranic elements and how use of the protein can sensitize the metal’s luminescence, which could lead to potential medical and industrial applications. Abergel’s group has already developed a compound to sequester actinides and expel them from the body. They have put it in a pill form that can be taken orally, a necessity in the event of radiation exposure amongst a large population. Last year the FDA approved a clinical trial to test the safety of the drug, and they are seeking funding for the tests. However, a basic understanding of how actinides act in the body was still not well known. “Although [actinides] are known to rapidly circulate and deposit into major organs such as bone, liver, or kidney after contamination, the specific molecular mechanisms associated with mammalian uptake of these toxic heavy elements remain largely unexplored,” Abergel and her co-authors wrote. The current research described in PNAS identifies a new pathway for the intracellular delivery of the radioactive toxic metal ions, and thus a possible new target for treatment strategies. The scientists used cultured kidney cells to demonstrate the role of siderocalin in facilitating the uptake of the metal ions in cells. Crystals formed with the protein siderocalin and curium complexes exhibit bright red luminescence when exposed to UV light. The team used crystallography to characterize siderocalin-transuranic actinide complexes, gaining unprecedented insights into the biological coordination of heavy radioelements. The work was performed at the Advanced Light Source (ALS), a Department of Energy synchrotron located at Berkeley Lab. The work was funded by the Department of Energy’s Basic Energy Sciences program in the Office of Science and the National Institutes of Health. The paper’s co-authors are Benjamin Allred, Stacey Gauny, Dahlia An, Corie Ralston, and Manuel Sturzbecher-Hoehne of Berkeley Lab, and Roland Strong and Peter Rupert of the Hutchinson Center.